How do I enable Credit Cards and Paypal (Powered By Braintree) on my Store? PayPal (Powered by Braintree) is a fast and easy way to accept both credit card and PayPal payments on your store. To use this payment method on your 3dcart store, you will connect your 3dcart store to your Braintree Payment account. If you do not yet have a Braintree account, the setup process in the 3dcart admin will allow you to create one. This payment option is pre-installed on your 3dcart store, but it can also be added as an additional payment option. For the purposes of this article we will discuss both ways of enabling it. In some cases, after setting up this payment method, the PayPal logo may be missing from your store's View Cart page, or you may receive an error that PayPal is not enabled. In this situation, you will simply need to contact Braintree in order to connect/link your PayPal Account to your Braintree account. After linking your accounts, the button will appear within 24 to 48 hours. Next, click on the "Select Payment" button located under "Payment Methods"
Click on the toggle switch to turn the module "On" and expand the payment option. Once expanded, you may change the "Caption" of the payment method to whatever you'd like it to read on the store front. By default, it is listed as "Online Credit Card or PayPal" but you may click on the wording and tailor this caption to suit your needs. This is Optional. The description will display next to the payment method – Example: Pay securely with your credit card or PayPal Account! Once you've configured your advanced settings, click on the "Save" button to get back to your regular Braintree Module settings. Next, we will go through the steps needed to connect your store to your Braintree account. These next few steps will describe the process of connecting your 3dcart store to your Braintree account. If you already have a braintree account, you will simply log into the Braintree service. On the other hand, if you do not yet have a Braintree account, you can create one with these same steps. Your store is not connected with PayPal Braintree. Click on the button to connect it. Click on the "Connect with Braintree" button. If you already have a Braintree account, you may click on this tab to enter your login email address and password to the Braintree service or otherwise register an account with Braintree. Alternately, you can connect your store directly by clicking the "Enter Credentials Manually" link below the On/Off switch. This will allow you to simply enter your braintree credentials directly rather than going through the onboarding process. Your store is already connected with Paypal Braintree. Click on the Paypal Braintree button to disconnect it. This can be used to tokenize your shopper's billing information on the Braintree service to expedite future transactions for the shopper on your store. This can also be used for 3dcart's Recurring Order/AutoShip functionality. If you elect to use the Braintree Vault option, be sure to also have the tokenization option enalbed on your PayPal account. Having this checkbox marked will make it so that payments are only authorized during the checkout process on your 3dcart store. This does not actually charge the shopper's card but rather verifies the card and authorizes the sale so that checkout can occur. After the order has been processed and shipped, you can collect funds and process the Sale. This checkbox will enable the gateway's Test Mode which will let you process test orders without actually charging the credit card. Use this checkbox if you'd like to enable PayPal's Fraud detection module (provided through Kount). Check with your Braintree account for more information on the Fraud Detection Module and if it incurs additional charges. Add a PayPal Credit® payment button to your store, giving customers fast, easy access to financing. Enable this checkbox if you would like to offer the PayPal Credit service to your shoppers via this gateway. Once you have fully configured your Paypal (Powered By Braintree) payment option settings, be sure to click on the "Save button at the top right to commit your changes. Even though the PayPal/Braintree payment option is pre-installed on your 3dcart store, there may be times when you need to also create a secondary version of the payment option for your business (perhaps to have it available for different pricing groups, or locations, etc). Fortunately, we've made it possible to also add additional PayPal/Braintree methods on your store using these steps and the steps above. Next, click on the "+Add New" button located at the top right of the page. Configure your payment method's settings as needed, and - when selecting the module from the "Payment Method" dropdown menu - look for "Credit Cards and Paypal (Powered By Braintree)" on the list. After adding the payment method, the same settings described in the first half of this article will be available to you on this newly added method. In addition to being a gateway for credit card payments, PayPal powered by Braintree also adds PayPal Express as an additional payment option. In previous versions of PayPal Express, the customer would be redirected (from your store), to the PayPal Express login pages to complete their transactions. 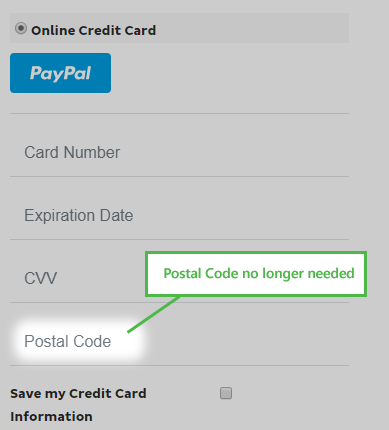 On a previous integration with the PayPal/Braintree payment module, the credit card payment option required the customer to also enter a Postal Code when entering their card information. This was due to the Braintree API being used at the time (JSv2) as well as AVS CVV Rules set on the Braintree account. First, make sure you are using the most up to date HTML checkout template from the common folder as mentioned here. If you're using the latest template and the Postal Code field still appears on the credit card payment section, you may need to adjust the AVS and CVV rules on your Brainstree account. Please click here to get information from Braintree on this aspect of your account.